Vivan Sundaram is one of those artists who have explored history using different art media. 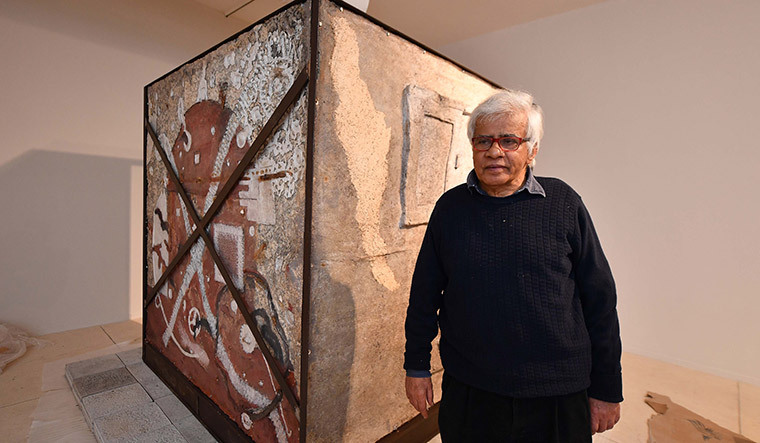 As many as 180 artworks created by the 74-year-old artist over half-a-century, are being exhibited at his retrospective show ‘Step inside and you are no longer a stranger’ at the Kiran Nadar Museum of Art, New Delhi. Large room-sized installations, photographs, drawings, paintings and sculptural garments created five years ago for a fashion show with technical help from Pratima Pandey, video installations and pieces of art from Sundaram’s beginning years are on display. “There is a sense of history, a historic figure or a historic memorial. And, then, there are things that are personal,” said Sundaram, who started in 1968, when he was a student at the Slade School of Fine Art in London—a time when he used to make pop-kitsch paintings. The exhibition brings together as many as ten of Sundaram’s major installations from the 1990s to the most recent one in 2017, including River Carries Its Past, House, Boat, Carrier, 12 Bed Ward, Insurrection 1946, Bunk Bed, Great Indian Bazaar and 409 Ramkinkars. In these installations, he has traversed through the industrial landscape and discards, oil grids, things sourced from local flea markets and second-hand markets, to fragile terracotta recasts of modernist-master-sculptor Ramkinkar Baij’s famous sculptures, Santhal family and Mill Call. The exhibition, that is on till end June, houses a “Family Room”, which consists of the Sher-Gil archive, an arrangement of his personal and family history. Photographs of family members juxtaposed with other personal objects, such as handwritten letters by Amrita Sher-Gil, old ivory lace, a warped fan and a broken crystal wine glass are also part of the Sher-Gil archive. The room also contains a hexagonal closet, the video Indira’s Piano, a carpet designed by Amrita Sher-Gil that has been at the Kasauli Art Centre for the last 50 years, Umrao Singh Sher-Gil’s photographs of Amrita Sher-Gil, and self-portraits. A suite of 12 large paintings including The Sher-Gil Family, Guddo, Two Friends, Ten Foot Beam and Big Shanti, that were made by him in 1980s is the highlight of the show.